Additional Info: Sabrina works as a freelance horn player and brass teacher, and is based in South London. A well-travelled performer, Sabrina has played in orchestras in China, India, Europe and the UK. Her orchestral work includes the Bombay Chamber Orchestra, Orchestra of Stowe Opera, and the British Sinfonietta. One of Sabrina’s favourite orchestral performances to date has been under Sue Perkins, where Sue conducted the orchestra with a toothbrush! 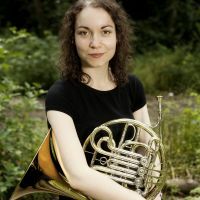 Period horn playing has led Sabrina to perform with Benslow Baroque Opera, Essex Baroque Orchestra, Dartington Festival Baroque Orchestra, and with the period wind ensemble Syrinx Winds. Sabrina is also a keen chamber musician, and performs with Martineau Brass and South West Brass, and in larger ensembles such as the Spectrum Ensemble, and the Matt Gough Jazz Dectet. She has recently premiered a chamber piece by Gordon Carr, and has performed the (mis-attributed) Haydn Double Horn Concerto to great acclaim.